Many of you reading will already know what I was doing on Saturday, but I want to get this written up anyway. So here goes. My alarm went off at 6:30am. Being a chronic insomniac, it was pure luck that I had actually got to sleep by about 2am and so had had some sleep before hand. Strangely I find it easier to function after four hours sleep than after seven, if not for very long, and so I forced down a double dose of painkillers and coffee and managed to get washed and dressed – no small feat for me at any time of day. The I bundled myself into my powerchair and we were off. First stop was a bus into Evesham. Karen and I walked/rolled to the bus stop and waited in the cold. Eventually the bus arrived (We knew it would be wheelchair accessible this time because Karen had phoned to check the day before) and we travelled twenty minutes or so into town. Then we had to go on half a mile from the bus station to the train station. I had pre-booked assistance to board the train but not tickets, so we went via the ticket office to buy the tickets. £74 of tickets, which went on credit. Protest is costly, in more ways than one. Trains to London actually depart from the other side of the platforms and my chair wasn’t going to go over the footbridge and so we left the ticket office and went around to the other side via the main road, which took a few minutes. After a few minutes wait in the very cold waiting room (people in wheelchairs are told to arrive half an hour before the train is due, as well as to book 24 hours in advance) the train arrived. Unfortunately when I found the car which I had been booked into, it turned out to be beyond the end of platform. The train manager looked a bit harried as we walked all the way to the other end of the train so that he could put us in first class where there was another wheelchair space. The next hurdle was that there was hardly any room to manoeuvre on the way in to the train and I got stuck trying to get past the luggage space. I had to get out of the chair and the train manager actually lifted it clear of the obstruction, all 90KG of it. Once we were underway I settled down with a coffee and tried to eat the bacon roll which we had brought with us, and I wrote a blog post to explain why I was protesting. In London I got off the train after a brief delay while the ramp was taken to the wrong end of the train, and we made our way out to catch a bus to our meetup location. I must say that I am very impressed with the wheelchair ramps on London buses. There is a button next to the middle door to alert the driver of a wheelchair, and then after passengers have disembarked the doors close again while the motorised ramp is lowered. Then the doors open and allow the wheelchair to board, with plenty of space to get to the designated wheelchair spot. I wish these buses were everywhere. We got to the McDonalds where we were meeting far earlier than we needed to but we started to bump into other people arriving for the protest anyway. I was pleased to recognise someone that I had seen at a march in Birmingham the previous June, and even more pleased when I realised that it was in fact @pseudodeviant who I knew from Twitter. It turns out that we had met, and had been talking to each other online but not realised who we were! We were approached by John Domokos, a video journalist from The Guardian who interviewed us both about our reasons for protesting. The first of many interviews I would do that day. After a few minutes I met and talked to one of the organisers of our protest about our plan. The number of wheelchairs and other disabled people hanging around outside was making us a bit conspicuous so he suggested I go to meet up with another group a short distance up the road. I was really please to find people from UK Uncut waiting there to assist us, including some people that I had been talking to over the internet for more than a year but had never met. There was much chatting and smiling. Then just before twelve we all moved off towards Oxford Circus. Volunteers from UK Uncut waited for the lights to go red and then ran across the Regent Street crossing with a chain, locking it at both ends. A line of people disabled people followed rapidly and took up their places along the chain. I was near the back of the line as I was waiting for Karen to return with food for me (I’m diabetic and had realised that I would miss lunch) so I rolled into place right at the end of the line across Regent Street, actually still on the pavement. We all locked on to the chain with D-locks and a cheer went up. We had done it! After that events were hectic and a bit of a blur to me. Being on the end of the line I was the prime target for hoards of journalists. I did interviews with more than I can remember. 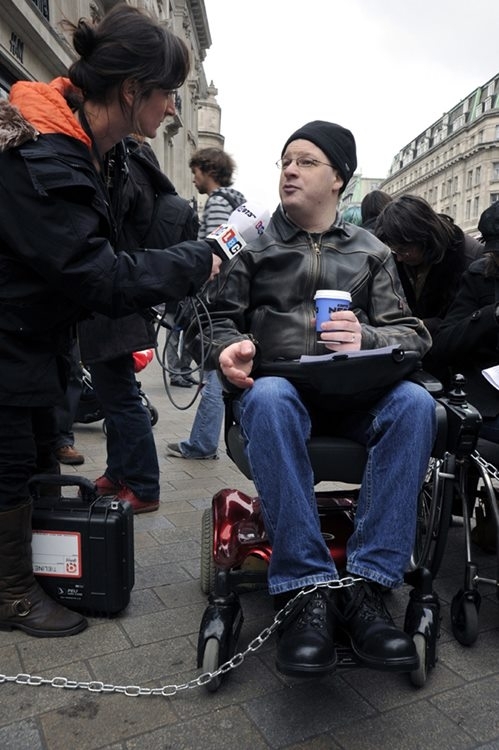 I did pieces to camera, for podcasts and radio, talked to journalists scribbling notes, to people from the BBC, The Guardian, The Times, LBC, to more than one team from each of those. I talked constantly for two hours, and my head was spinning. I did a live piece for the One O’Clock news on BBC London radio. The noise of the crowd and the samba band was quite overwhelming and it was only adrenaline from the audacity of what we were doing that kept me going. In between the journalists I met people who I had been talking to on Twitter for months. A great many people seemed to recognise me, which frankly I found quite scary! I also was very pleased to meet Laurie Penny, if only for thirty seconds or so. Throughout the protest people from UK Uncut and others constantly checked if we were OK, offered tea and coffee, and kept us updated with what the police were saying. I was quite impressed with the police, the Met were calm and pleasant and smiling, which was unexpected. They did pull up with sirens blaring, but then who doesn’t like a good excuse for blues and twos? Two police vans stopped in front of the line and blocked us from the rest of the junction and a row of police lined up in front of the vans facing us. Police did try to take down a banner that was being held across the Tube entrance, and there was a Met cameraman carefully videoing us all, no doubt for the database of protesters that they deny keeping. After about an hour the police made an announcement. I haven’t got a clue what they said, because it was completely incomprehensible, even without the sign-language interpreter that one of the other protesters asked for! 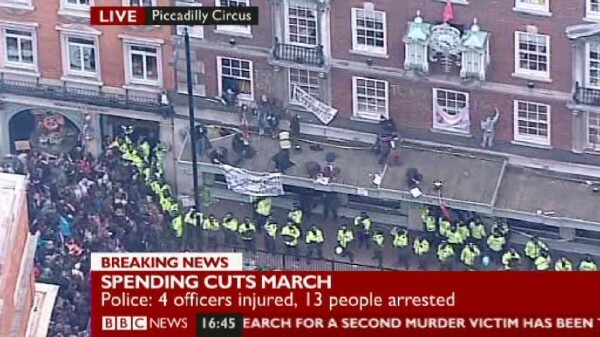 As we neared half past one it seems that the police were getting a little impatient. They informed some of our group that they would tolerate us if we moved aside to only block one side of the road, otherwise they would “take appropriate action.” I almost wish I could have seen what that appropriate action was, because I don’t think the police had any idea. No doubt they had disturbing visions of what the many journalists there would say about police dragging away people in wheelchairs, blind people, people on crutches. And it’s not as though their vans had wheelchair lifts or spaces. By the time the police had made their feelings on this matter known many of us were quite cold and uncomfortable. This protest was extremely draining for most of the people involved. Although many of us wanted to stay until forced to move, the fact is that most of us could not, and so we all agreed that we would leave at 2pm. In the end it was really chaotic. 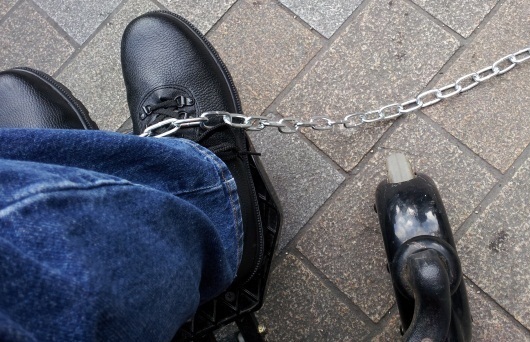 We all unlocked from the chain and a speech was made, but then no one quite knew which way we were going. Some people had mentioned adjourning to a pub to get warmth and food but as no one knew which one that didn’t happen quickly. We actually ended up milling around in the road and chatting until the police started to look quite stern at about quarter past two. On the way to the pub there wasn’t room on the pavement for all the wheelchairs, so they ended up in the road. 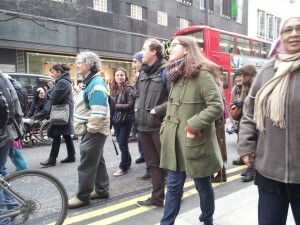 We were in a walking pace procession right down the road in Oxford Street. Eventually it became possible to get on to the pavement but some stayed in the road and a few minutes later some police vans came speeding down the wrong side of the road and then crept along next to the crowd. Eventually everyone reached a pub and tried to cram inside, although it wasn’t possible for everyone in wheelchairs to get in. Several other people and I ended up in a pub next door for an hour or so before moving across to the first pub were we were finally able to get some food and seats. Police waiting outside our pub - were they lonely? We had a lovely time in the pub and I met yet more people who I previously knew only through Twitter. I stayed far too long for my own health but I had already condemned myself to days in bed in pain and not moving and this was a very rare opportunity to meet people and so I pushed through with help from copious painkillers. Eventually Karen and I left the pub and returned to Paddington station. The train back to Evesham is only every two hours and we had more than an hour and a half to wait. We passed the time sitting in a coffee shop at the station and I began to zone out from exhaustion and the strong painkillers that I take. At this point the crowds and the noise of the station seemed like distant things and I was floating in a haze of opiates and tiredness. When we went to find our pre-booked assistance for boarding half an hour before the train was due to leave the manager told us that Evesham station was unmanned after lunchtime, which we already knew, but he also didn’t think there would be any staff on the train who could place the wheelchair ramp for me instead of station staff. This caused me to panic a bit but the station manager called another manager who called the train driver who thought there might be staff on board after all. I went to board the train, which is where we discovered that the train did not have a wheelchair space at all. I eventually ended up blocking the door area with my wheelchair for the whole journey. I am quite surprised that the assistance booking line were not aware of the situation with the station staff, the train staff or the type of train. I was really uncomfortable so I moved to a seat next to Karen, and after Oxford I moved to an empty double seat where I tried to stretch out to relieve some of the pain. I crashed completely at that point with horrific burning and aching pain in spite of my double dose of painkillers. I was in so much pain that I was crying, and trying to hide it from the other passengers. When our train arrived at Evesham sometime around midnight I had passed out from pain and exhaustion. Karen tried to get me to move back to my powerchair but was unable to wake me up. My memory of this is hazy but I know that I did stir a little and try to stand but could not, and I ended up on the floor of the train and then slumped across the arm of my wheelchair. I understand that a stranger on the train helped Karen to lift and drag me into my chair. Unfortunately when we arrived the ticket inspector could not unlock the ramp at the station. She had been given the code for the lock but it did not work. My family had come to meet me at the station to drive us home and so I was carried off the train into a manual wheelchair by my brother, mother and wife, apparently dropped near the edge of the platform on the way. They also carried my extremely heavy powerchair off the train. Between them my brother and my wife got me into the car and then from the car to my bed, although I was almost completely unable to move. And so that is where we are now. I am still in bed at the end of Monday, 48 hours later. I have managed to visit the toilet a couple of times, and I eventually managed to change my clothes this afternoon, but I’m in a lot of pain and I can’t really do much. This is all completely in line with what I expected and I am doubtful if I will be spending any time out of bed before next weekend. This is what the protest cost me, what I knew it would cost me. All I can do is hope that the politicians notice and reconsider their policies. This video is my personal update from Sunday afternoon. We also got some attention from a Tory Basildon Councillor. 12:30pm Today I will be trying to update this blog as much as possible with information from UK Uncut’s Block The Bridge Block The Bill. Updates start from the bottom and new ones appear at the top. Refresh to see the latest updates! I apologise for the twitter error messages. They will eventually turn into embedded tweets when twitter finally allows my webserver to see them. 18:32 Police say that everyone in containment has been released. 18:13 Here is the report from Channel 4 news. See 15:08 for the BBC report. 17:45 There was some confusion because there are protests on two bridges. There are still people on one of them. 17:42 Channel 4 news is reporting in depth on the protest and the Health and Social Care Bill. 17:37 Most people appear to be free to go now. 17:18 Tim Hardy reports on the video that police will arrest remaining people under the public order act for breach of the peace, and that they will be searched. Met police announced that journalists should identify themselves to the police now. @bc_tmh telling the police arresting him that 168 people are watching them live. 17:16 Some tweets from @marmite_ about people being held back. 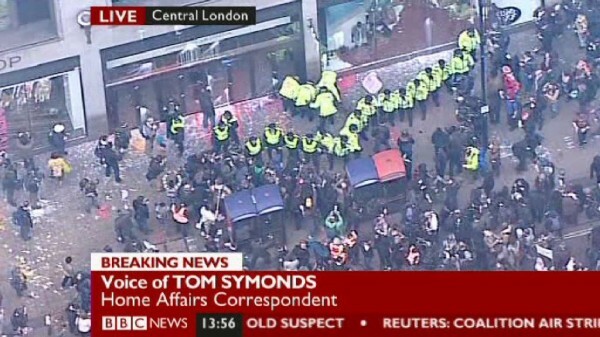 16:56 Reports via live stream that some people are being kettled by the police. Met police claim some people “not associated with UK Uncut” are attempting to march. 16:55 People blocked from leaving from Westminster end. 16:53 There is a police helicopter over the protest now. 16:33 @HeardinLondon reports that the bridge is being cleared now. 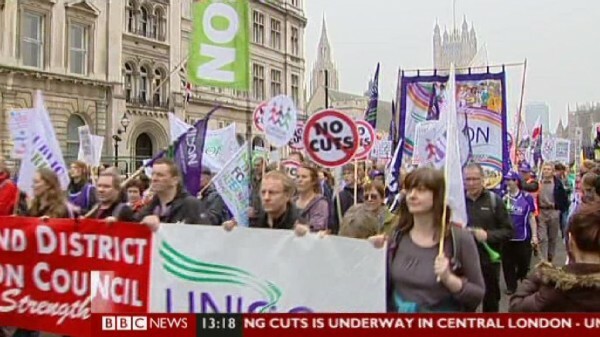 16:30 ITV News has a video clip from the protest on their website. 16:22 Protesting is a family event! 16:15 Rumours of police movement too. 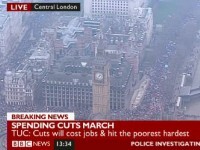 16:11 Rumours that protesters are marching to Parliament Square. 15:29 Here’s a UK Uncut video from 26th September. 15:08 This report was shown on BBC News at 14:21. It’s the only coverage by the BBC so far. 15:06 Comedy on the bridge. 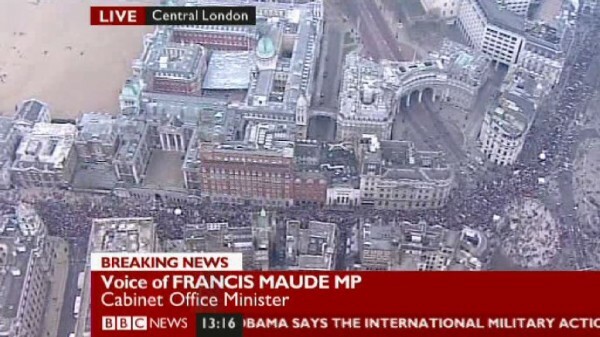 15:04 BBC News channel is once again silent on Block the Bridge. However, there’s a great banner on the bridge right now. 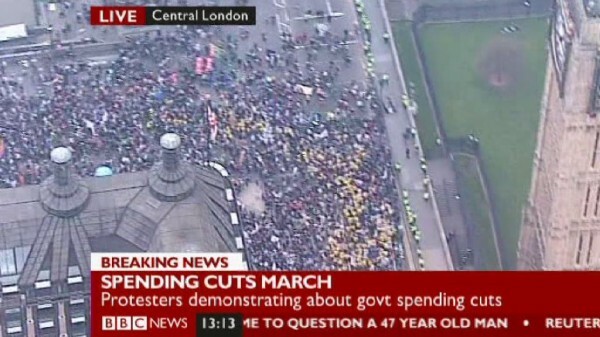 14:22 BBC News is finally reporting on the protest. Video will appear here shortly. 14:12 Watch live at Bambuser – broadcast by Tim Hardy. 13:42 Still no sign of any mainstream news coverage. 13:15 Actual reporters have been spotted! 13:04 Everyone on the bridge lying down. 12:48 Lots of photos are appearing on twitter. Watch @HeardinLondon for the best pictures. 12:43 Tim Hardy (@bc_tmh) will be broadcasting live from the bridge. If this embedded clip doesn’t work, please check his website. I apologise if you are here looking for the account by @Magiczebras of the UK Uncut protest in Fortnum & Mason and the arrests afterwards. She has been advised to take it down until after the case is resolved, and so I have done so. Please note: The news media and others use the word violence to mean both attacks on people, and attacks on property. I believe this is misleading, and attacks on property should be referred to as vandalism, however when I am talking about what other people have said, I will use the word violence if that is what they used. 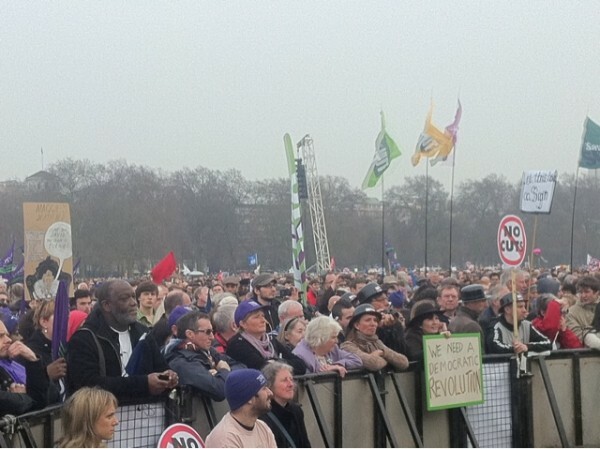 On the 26th of March the TUC held the March For The Alternative in protest against government cuts to services. UK Uncut were also active that day, first joining the march, and later as the TUC marchers listened to speeches in Hyde Park they occupied shops in other parts of London. While all this was going on a group of people dressed in black and with covered faces, a tactic known as Black Bloc, broke windows and threw paint bombs at shops and banks, and sprayed anarchy symbols wherever they could. The news coverage has been all about this vandalism and later fights with the police. For more information from people who were there, please read these accounts. 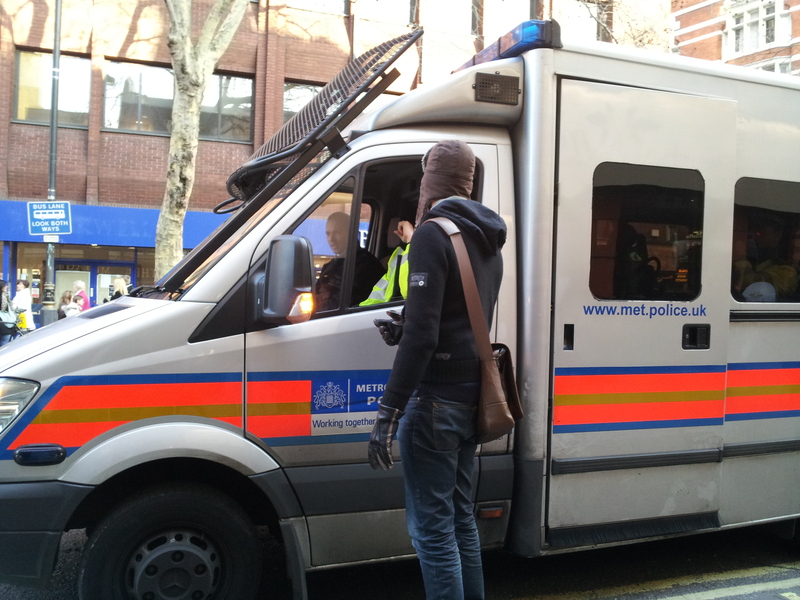 Peaceful occupation and arrest which is a guest post by Anna (@magiczebras) on this blog. Diverting slightly for a moment, let me say that the charge of Aggravated Trespass for the Fortnum & Mason occupiers seems very odd. Fortnum & Mason is a privately owned shop, open for business. This gives the public an implied license to enter private property, so on entering, UK Uncut were not trespassing. In this situation a person can only be considered to be trespassing if they are asked to leave. They were not asked to leave, and in fact as the video above shows they were actually prevented from leaving by the police for a while. The charge of aggravated trespass also requires that a person enters the land with the intention of disrupting the normal activity there. In this case, customers were able to continue browsing the shop and even drinking tea. The arrest of 138 peaceful protesters while ignoring most of the people smashing windows is baffling, the lying to them before hand, and their treatment afterwards even more so. After the march many people including the TUC condemned the vandalism and violence, and seemingly, all groups that protested separately from the main march. Arguments broke out between different groups that otherwise would be united in opposition to the cuts. People were accused of hijacking the march. Richard Murphy at Tax Research UK said on his blog UK Uncut are right in protesting – but it would have been better not to do so on Saturday, which seems to be the opinion of many union members. 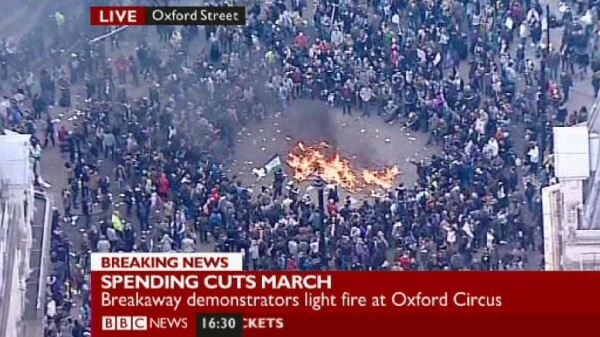 Some members of UK Uncut distanced themselves from black bloc protesters, while others did not. On the 28th of March Lucy Annson, a UK Uncut protester, appeared on Newsnight and refused to condemn the violence at the march. This video is the Newsnight interview. Following the march MP John McDonnell started Early day motion 1146 stating “That this House congratulates UK Uncut for the role it has played in drawing attention by peaceful demonstrations to tax evasion and avoidance and to the need for firm action to secure tax justice.” It was signed by 27 MPs. During Prime Ministers Questions on the 30th of March David Cameron was asked to comment on UK Uncut. Here is what he said. The Prime Minister: I thank my hon. Friend for her question. First of all, we should be absolutely clear that the scenes in central London of property, shops, banks and livelihoods being destroyed were completely and utterly unacceptable. The police should have our full support for the way they policed the march and the action they took. I think that it is important for people to understand that UK Uncut refused to condemn this violence and Opposition Members should remove their names from the early-day motion. After this statement five MPs withdrew their support for the motion. A growing number of people are expressing the idea that the anti-cuts movement should have solidarity across all forms of protest. The idea being that you don’t have to support a groups tactics, but if you support their aims then you should not condemn the group either. Early on in this argument the Brighton Solidarity Federation wrote A letter to UK Uncutters from the ‘violent minority’ In it they stated “We think the whole idea of dividing ‘good’ and ‘bad’ protest serves only to legitimise police violence and repression. As we saw on Saturday, repression is not provoked by violent actions, but by effective actions – there is a long history of peaceful pickets and occupations being violently broken up by police, from the Chartists to the Miners Strike.” Vince Cable stated that he would not change policy as a result of protest. He said “No government – coalition, Labour or other – would change its fundamental economic policy simply in response to a demonstration of that kind.” Given this statement many will argue that more drastic tactics are necessary anyway. This Comment by Kate Belgrave on an article at Liberal Conspiracy gives some insight into this solidarity. Some of us are aligned to no particular groups and are simply pleased to see protest against cuts breaking out in all shapes and forms. Want to kick in a window? Fine. Join Black Bloc. Want to sit-in and close a bank down? 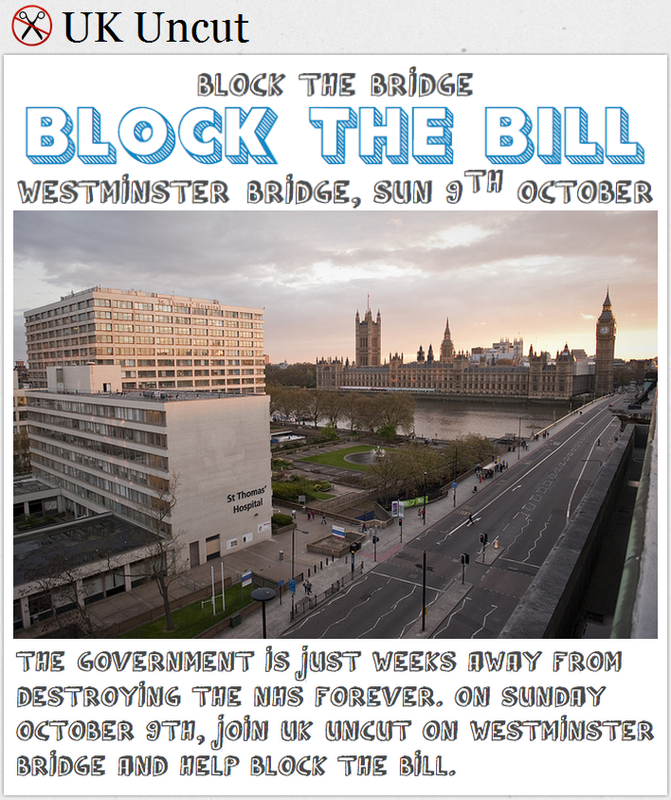 Good – sign up with UKUncut. Want to march with a big group of union members? Excellent. Head out with the TUC. It’s all part of the same thing – an angry reaction to Conservatism. Nobody owns any of it. Nobody has the right to say how protest should look, or what does and doesn’t work, or to try and define the tone. Some of us see the thing as a whole, not as a bunch of competing bits. 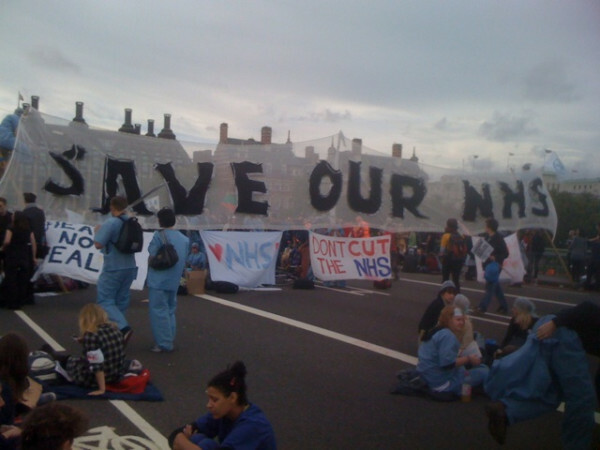 Tim Hardy wrote a very interesting article at Beyond Clicktivism: Solidarity Forever. In it he wrote about the Saint Paul Principles. In his words: “These are a set of principles of unity for resisting the 2008 Republican National Convention (RNC) agreed in February 2008 by those planning to confront the RNC.” These principle are set out below. I agree that these represent an excellent model that all anti-cuts groups would do well to follow. 1. Our solidarity will be based on respect for a diversity of tactics and the plans of other groups. 2. The actions and tactics used will be organized to maintain a separation of time or space. 3. Any debates or criticisms will stay internal to the movement, avoiding any public or media denunciations of fellow activists and events. 4. We oppose any state repression of dissent, including surveillance, infiltration, disruption and violence. We agree not to assist law enforcement actions against activists and others. Only a handful of people knew where we were heading on Saturday, I personally had no clue where we were going. Just before 3.30pm I was simply handed a card with a red dot on, a sign that I should follow the red umbrellas several people were holding. Once we arrived in Fortnum & Mason we spread out across the shop, and the vibe was pretty jubilant – I’d had doubts we’d make it and I suspect I wasn’t the only one, if you were in London you’ll know the day was quite crazy. After about half an hour people started to settle, the majority of us on the ground floor. I talked to people I knew on twitter and sat around talking with my friend, who left at around 5 to get her train. People did drift out but the majority stayed. The police hadn’t asked us to leave and we were peaceful. 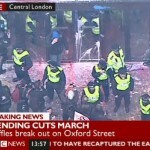 A few people may have wanted to cause damage but were quickly talked out of it by members of UKuncut, we didn’t want to harm our reputation for being a peaceful protest group. I’m so proud of all my fellow members, we were all exceedingly careful not to break things and received thanks from police officers for tidying around before we left. At around 6pm it was democratically decided we leave, so we all linked arms tight after being told we could leave peacefully together. We were kettled immediately. There was a lot of confusion, at first we thought they’d let us go in dribs and drabs, then we were told we’d be arrested. I was put onto a coach with 17 others and we drove around London until it was discovered Islington had 15 free cells and Camden had 2. I was first out, requiring medical attention because I had low salts. Everything was taken from me, I was stripped to my underwear, given clothes, put on constant watch because, due to anxiety, I kept absent mindedly clawing my arms and I slept when I got to my cell, still being watched. I was woken at 2am to see my appropriate adult, get my DNA taken and see a doctor (5 hours after I’d started requiring one). He gave me a sleeping pill and got them to feed me. I slept more, was woken with breakfast which I threw up on my clothes – I didn’t have time to get to the toilet. They couldn’t give me clothes or a blanket so I lay in my underwear and slept more. My mother arrived sometime later, her nerves fraught and I waited to be charged. I convinced myself it wouldn’t happen, they’d let us go, but obviously they didn’t. I was charged with aggravated trespass, made to promise I wouldn’t kill myself, or hold them accountable if I attempted, given my bag back (they retained my mobile, iPod and clothes as evidence) and we left. I’m in court on Monday, 12th April at 9.30am, where I will be tried. Looks like I’ll be joining to Armchair Army for the forseeable future. I am exhausted. I’m so tired that I can’t get out of bed right now. 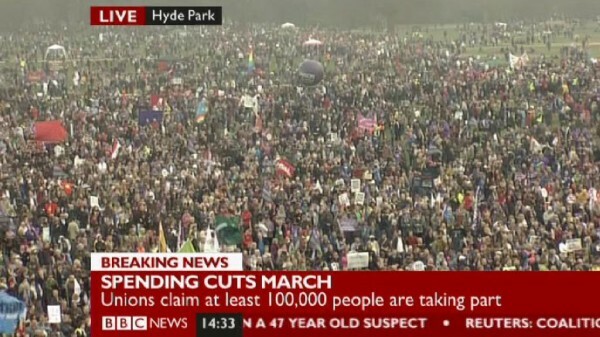 This is because I spent yesterday supporting the March For The Alternative and UK Uncut in any way I could from home. My living room became a media hub. Along with my sister (@apricotmuffins on twitter) I watched multiple TV news sources, twitter, blogs, emails and news websites. To do the job we had four computers, six screens (including the 32″ TV) and phones, laptops etc. Both of us had Tweetdeck running with six columns of tweets and hashtag searches. 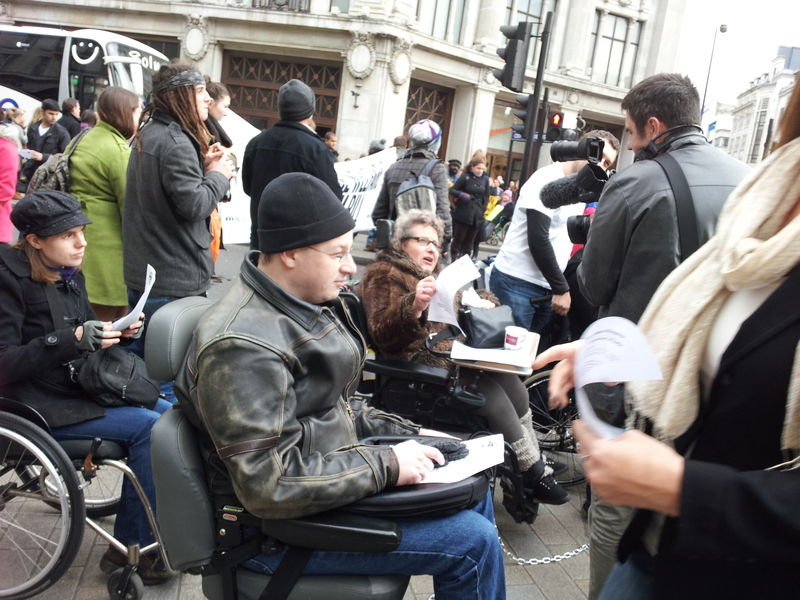 Late on Friday I was drafted in to help out with the virtual protest map from Disabled People Against Cuts. 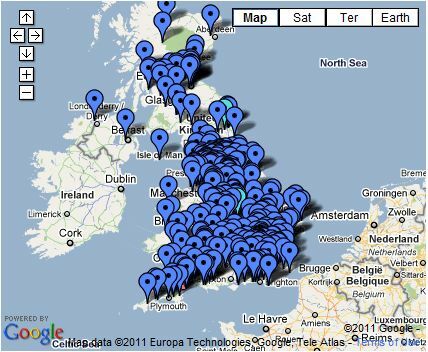 This is a map of many people that could not protest because of illness or disability. After a chat on Skype with the organiser I got to work adding emails of support to the map, eventually getting to sleep after 3am. Saturday morning, I had promised to spend an hour with my wife over breakfast. I stuffed myself full of painkillers around 9am, and drank coffee. I sent my wife to take coffee to my sister (who lives next door) and wake her up ready for our day of virtual protesting. A quick check of twitter showed that my automated scheduled tweets about the protest map were being retweeted at a good pace, drawing attention to it. I replied to a couple of tweets to clear up some confusion that my scheduled tweets had caused – people had assumed that I was awake! Then at 10am I staggered out to the Lantern eating house for breakfast with my wife. To resist temptation, I handed my phone ever to her to keep it away from me! We enjoyed a nice breakfast and I managed to talk about things other than the protest. Back in the house at 11, my sister and I set up for our protesting. She moved her computer into my house while I frantically tried to fit an extra hard disk into my PC to handle all the TV recording that I would be doing. Unfortunately my new gigantic heatsink was making this difficult! Finally at a little past 11 we were up and running. I sat at my desk with my PC, my old iMac on a table behind me. I set my PC to recording Sky News, and my iMac recording BBC news. My sister was watching on the main TV, switching between channels as they showed anything relevant. Our biggest task of the day turned out to be keeping the DPAC map up to date. Logging in to the email account showed 54 messages waiting to go online, with more pouring in. I set my sister up with the email and map and showed her how to add people, and we attacked that task. I did the ones with pictures myself as it was a little more involved. Some where frustrating, since they didn’t include their location which made it difficult to add them to a map! Others had misunderstood and sent us long messages, promotions for events and other things which were not suitable for our map of solidarity. All the while we were carrying out this task we were also watching twitter and the TV for updates about the march. Any time an interesting comment, update or insight came up on twitter I retweeted it to my followers. When the TV showed us anything interesting I reported that on twitter as well. As the day developed, I started to grab screenshots from the TV news and put them up on twitter. Although I was recording everything, the only clip that I managed to get online was a part of Ed Millibands speech. I’ve got hours of footage that I hope to publish a bit more of later. This whole process was very intensive. I have to admit it was very difficult for anyone else to speak with me since I was completely immersed in what I was doing. Our atmosphere, much like the march, was one of excitement. Unfortunately this was all very draining for me. I eventually had to stop for a rest, in spite of the constant supply of caffeine and codeine. My first rest was 10 minutes on the sofa but still watching the TV. It wasn’t really a rest for me, but it was enough to keep me going a bit longer. My second rest was rather forced on me since I had completely run out of my ability to stand or walk, was scrambling up bits of what I was writing, and forgetting what I was doing. Lots of drugs, tea, and half an hour flat on my back in pain, and then I forced myself back to the computer for the final stint. For the final part of the day we were retweeting as much of UK Uncut as we could, although there wasn’t a lot available. I put together a blog post with some text and a lot of screenshots from the TV news. I wanted to produce a report on UK Uncut but I just didn’t have enough information, and the photo sharing site that they were using seemd to have crashed under the load. Finally, I was just too tired to continue. I stayed at my computer a little longer, watching twitter but mostly zoning out. I eventually went to my bed around 8pm, and spent a lot of the eveing drifing in an out of consciousness. This was my day of protest. I can only hope it made a difference somewhere. You may have noticed that today is the day when the unions are marching against the cuts. 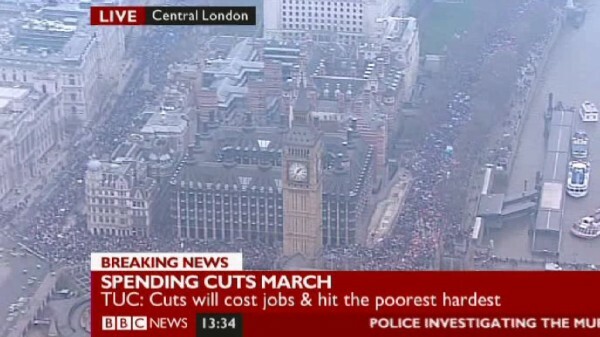 News media coverage seems good, with BBC News and Sky News both giving fairly constant coverage to the march. 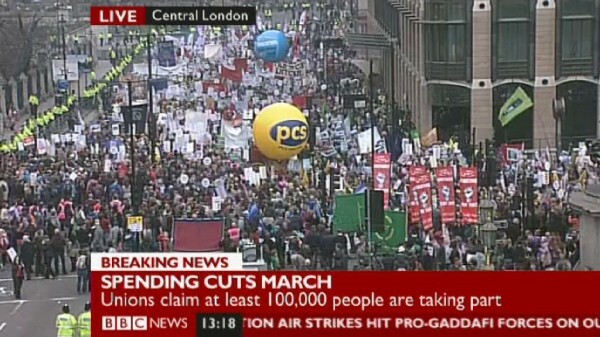 Although organised by the TUC, there are many organisations on the march. A great number of people are in Hyde Park listening to speeches, but there are so many people that the march was still arriving at 4pm! Estimates of total numbers soared to 400 – 500 thousand people in attendance. Read Why I’m marching tomorrow by @kaygeeuk, Why I’m marching tomorrow by @stavvers or New Statesman – Why I’m marching today for an overview. The march has been widely reported as a carnival atmosphere. Music, bands, vuvuzelas and other fun things. Such as a Trojan Horse! Ed Milliband spoke to the crowds in Hyde Park around about 2pm. Well, the ones that had arrived, anyway. March organisers have been criticised for having Milliband speak since he does not completely oppose the cuts, and many are disappointed that Caroline Lucas, leader of the Green party, was not invited to speak. 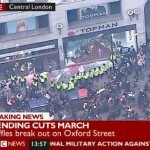 Also at 2pm, UK Uncut broke away from the march and went to Oxford Street to occupy shops. Unfortunately this was overshadowed by a group of approximately 150 people dressed in black and wearing masks, who threw paint and fireworks outside Topshop and Topman and then went on to vandalise the inside of HSBC at Cambridge Square. Metropolitan Police claimed that lightbulbs filled with ammonia were thrown at them, although we have seen no evidence of this. 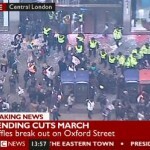 Around 4pm about 5,000 UKUncut protesters occupied Fortnum & Mason and surrounding area. See Press release: UK Uncut Occupy Tax Dodgers Fortnum and Mason. BBC News covered this including a phone call to BBC producer Almeena Ahmed who was inside with UK Uncut. 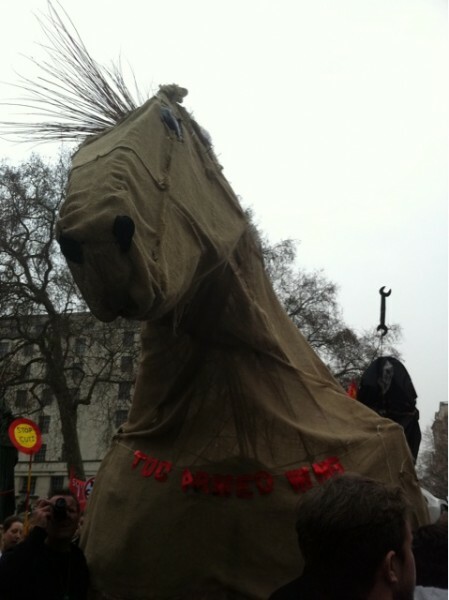 Later a fire was lit at Oxford Circus as a trojan horse was apparently burnt. 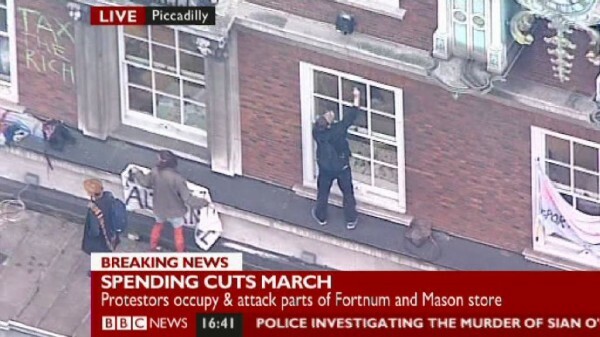 While UK Uncut where inside Fortnum & Mason, some of the black-clad protesters who had earlier thrown paint and fireworks and sprayed graffiti, climbed onto the roof to hang banners and spray more graffiti. The BBC alleged that they were from the Socialist Worker Party among other groups. DPAC has also launched Disabled People Make History. A couple of weeks ago I made a big fuss about UK Uncut taking over Vodafone’s World of Difference blogs. I was very critical of it here on my blog – see UK Uncut triumph over the Vodafone website… but lose my support. (I have actually edited that now to remove a lot of my initial criticism.) For the reasons why I was so critical, have a look at what Tim Hardy said in his response at Beyond Clicktivism in Activism is Serious Business. The main cause of my reaction was the seriousness of the potential offence. Computer crime can have some fairly serious consequences. But this leads me to an important question: How far can protesters go to make their point? All the famous protests in history, all the ones that made a difference, involved civil disobedience. The American Civil Rights Movement, the Suffragettes, and much that Gandhi achieved involved civil disobedience. How serious is the offence committed for the civil disobedience? What is the threshold of injustice at which civil disobedience becomes justifiable? Should civil disobedience target only unjust laws, or should protesters break other laws to make their point? Can protesters break a law to argue for the imposition of another law? One of my concerns is the severity of the law breaking. The actions of UK Uncut so far, in occupying shops and banks and refusing to leave, are civil disobedience. The protesters are trespassing once asked to leave by a shop manager. In England, trespass is largely a civil wrong not a criminal offence. To me, that makes it a less serious issue than damage to property or violence against people, which are criminal offences. Although seemingingly trivial, the unauthorised access to Vodafone’s blogs is potentially a breach of the computer misuse act, and therefore a more serious criminal offence. The difference is mainly academic in this case, but what about other more serious law-breaking? How far should it go? I don’t know. “All men recognize the right of revolution; that is, the right to refuse allegiance to, and to resist, the government, when its tyranny or its inefficiency are great and unendurable. But almost all say that such is not the case now. Many people are opposed to speed limits; they could argue that their speeding is civil disobedience against speed limit laws. Is that acceptable? Some people do not pay their council tax in protest at bad service in emptying their bins. How about that? Should civil disobedience be restricted to protesting against loss of freedom, or only breaches of human rights? It seems to me that civil disobedience becomes acceptable once a person has found a group of other people that accept it! The larger the group, the more acceptable, perhaps. Obviously there will always be a group of people opposed to these actions, otherwise it wouldn’t be disobedience. When Rosa Parks refused to give her seat to a white man, you can bet that an awful lot of white people thought she was wrong. Some would argue that the only laws that should be broken by the protesters should be the laws that they are protesting about. This would rule out occupations, refusing to obey police with a section 14 order, and all sorts of other protest methods. I have come to the conclusion that protesters must break other laws to make their point. Although the right to peaceful protest is enshrined in law, the government and the establishment work very hard to make it meaningless. An example being the current protest method allowed by the police: Arrive, march from A to B along routes checked by the police, getting in no ones way, then go home. All innocuous and quiet and not offensive in the slightest. And completely useless for achieving political aims, even when a million people attend. More is needed, but more may be illegal. And so laws must be broken to get results, or even to get noticed by those responsible for the injustice being protested against. UK Uncut are arguing for a change in the law to clamp down on tax avoiders. Inherent in this argument is a respect for the law – how can anyone argue for large companies to obey a law on paying tax if they themselves do not respect the law? Civil disobedience can only make sense in this context if the laws broken in protest are carefully selected. Go too far, break the wrong law, and the argument will fall apart and public opinion will turn against the protesters. And so, I have concluded that UK Uncut must break laws to achieve their aims. Since they are not directly protesting against specific unjust laws which they could break in protest, other laws must be broken instead. I think it is important to consider precisely which laws to break very carefully, or risk losing public support. But after much thought on the subject, and despite my initial reaction to their actions, they still have mine.